Hewitt School Adventures in the Nano Zone! Adventures In the Nano Zone! That is the title of the internet presentation that scientists from the Center for Sustainable Nanotechnology gave last Friday to 8th graders at the Hewitt School, an all-girls school in New York City. That was followed by lively Q&A sessions. During this week, Hewitt School students will be asking Center scientists more questions via comments at the end of this blog post, so stay tuned! Here’s the deal. Hewitt School teacher, Kristina Walter, had a section on nanotechnology planned for her students and also happened to see a link on Facebook to one of our blog posts. Crazy! Together, we came up with a little experiment. Last Friday’s “webinar” was an introduction to nanotechnology and the goals of our research center. As the students come up with projects related to nanotechnology, they will get some help from Center scientists via a Q&A in the comments section of this blog post. In another post, we will publish a sampling of some of the student projects. We’re happy we could help out and are super excited to see what the students come up with! Note: if you’re viewing these comments in google chrome you may have trouble viewing all of them, due to a recently discovered bug in our blog theme. If you hover your cursor over where the comments should be, they will magically re-appear. You can also try another web browser. The Strange New World of Nanoscience – Friday Video! You both have very interesting ideas and I think you would learn a lot and have fun researching either topic! You’ll probably be able to find more information about medicine in nanotechnology just because it is a very popular topic currently. But that does not mean you won’t be able to find good stuff about spider webs as well! I’ll do my best to give you some information about both and you guys can work together to decide which topic you want to explore! Both of your websites that you have listed look like fine sources of information. The properties of spider’s webs are also really interesting and when you bring in the nano side of things to this topic it gets really cool! This would be a really good article to start with http://cen.acs.org/articles/90/i13/Learning-Spider-Silk.html. And this article http://www.nanowerk.com/news2/newsid=29642.php. Here they use the “stickiness” of spider webs to influence an adhesive for medical applications. The materials of spider webs are quite curious and have awesome properties; if scientists can uncover the “secrets” behind these materials we can really benefit from these properties! Good luck on your project, I’m sure it will turn out awesome! Thank you so much for video chatting with my class and me on Friday. One of the things I was really interested in the video we watched and what you talked to us about was how nano-particles could detect cancer tumors before they actually do damage to you. Could you tell me a little about that? I also would like to know more about how the water filter uses silver nano-particles to filter dirty water into clean water. I am thinking about researching nano-technology in cosmetics and how they have the ability to detect melanoma in the skin as well as just clearing wrinkles. This is sort of linked to how nano-particles could detect tumors. Could you tell me a little about that study, and how it is more important than just moisturizing skin? Do you think this website is reliable? http://scienceinsociety.northwestern.edu/content/articles/2012/nanotechnology-and-science-beauty What other websites do you think are reliable? Again thank you for all your help! These are some excellent questions. First off, Science in Society is a science outreach website run by people at Northwestern University. It is a very good place to look for science news. Here are some other useful websites for getting general nanotechnology news. Regarding nanotechnology in cosmetics and personal care products, the Project on Emerging Nanotechnologies has a fairly complete list of all the consumer products that currently contain nanoparticles. Nanoparticle-based methods for the early detection of cancer are one of the most exciting applications of nanomaterials in biomedicine. Researchers are using several types of nanoparticle-based sensors to to trap and identify small molecules that indicate the development of tumors. Hope that helps. Thanks again for your questions. Hi thank you so much for video chatting with us this Friday. I found everything you talked about so interesting. We were fascinated by how many things use nanotechnology. For an upcoming project my partner and I want to research the usage of nanotechnology in braces. Also another topic we want to research is water proof swimsuits. How is this exactly possible, how does the liquid stay on the bathing for a long time? Is there any information that you have about this topic? Here is where we found all of our information do you have the time to look over and tell us what you think about it. Again thank you so much! Using nanotechnology in braces is such a cool idea and seems like a really fun project to research. The site you posted looks like it has some valuable information. These other two may also be of help: http://www.dentalgateway.co.uk/dental-blog/nanotechnology-helps-improve-invisible-braces/ and http://orthodonticsinlondon.co.uk/news/nanotechnology-used-in-orthodontics.html. It seems that right now clinical trials are still being carried out on these products to make sure they are safe, but it’d be really awesome if nanoparticle braces came out soon! Your other topic also sounds like a fun one to investigate! This whole idea is based on the ideas of hydrophobicity (meaning “water fearing”). You may have heard of the lotus leaf, it is a pretty cool example of a hydrophobic leaf found in nature (http://www.youtube.com/watch?v=MFHcSrNRU5E). But basically how this works is the bathing suit is coated in something that really, really does not like water. Their properties are too dissimilar where they don’t want to associate. As a result, the material on the bathing suit repels the water causing the bathing suit to not get wet! Similar ideas are being used for materials in tents and rain jackets. Both of your articles look like good places to get information from! You might also find http://www.azonano.com/article.aspx?ArticleID=3129 helpful – it looks at a few examples of nanotechnology in clothing, not just swimsuits! Good luck with your project! Thank you so much for skyping with us! We had a lot of fun and learned a lot. One topic we found interesting was how you can use carbon to make differently shaped nanoparticles. We were curious to know if the different shapes have different effects? Also, for our research project we are researching the Mars one trip, the one way trip to Mars, and we would like to know how nanotechnology will help astronauts survive in space and get there. Thanks for video chatting with us. A topic relating to nanotechnology that really interested me was hydrophobic spray. It is a spray which makes everything resistant to water. One of the sources that I have been using is this video. http://www.youtube.com/watch?annotation_id=annotation_936198&feature=iv&src_vid=7is6r6zXFDc&v=DZrjXSsfxMQ The video provides us with many different examples of how the spray is works. For example, when they show how if you spray the Never Wet spray on a pair of shoes, and then pour chocolate sauce it would not stain the shoes. I understand that the spray is hydrophobic, but how do they make the spray without using water? Also, if you sprayed Never Wet on your hair could it never be wet again? Another topic relating to nanotechnology that interests me is how nanosilver can make your socks smell good. How do they do this? I understand that the nanosilver acts like a sterilizer, but I am confused on why they don’t use this yet if it really works. The source I have been using is the video from your blog, however I still don’t fully understand how the silver kills the smell. The video from NeverWet is really neat! As you mentioned, NeverWet is designed to form a super-hydrophobic coating on whatever you spray it on. Regarding how they make the spray without water, it is almost certainly made with some mixture of organic solvent. Some examples of organic solvents would be acetone (used fingernail polish remover) or ethanol (the alcohol in beer and wine) As you rightly thought, the chemicals that give a NeverWet coating it’s hydrophobicity really don’t like being in water. So instead of mixing the chemicals into water, the manufacture mixes the superhydrophobic chemicals in some sort of liquid organic solvent and put it a spray bottle. When you spray some of the NeverWet out, you propel small (but not nano-sized) droplets of the organic solvent onto whatever you want to coat. The organic solvent then evaporates away, leaving only a coating of the superhydrophobic chemicals. Another benefit of using organic solvents (compared to water) is that they evaporate quicker then water, so your coating is ready quicker. So what if we sprayed NeverWet on your hair? Well first, this isn’t probably the safest idea. Many of the organic solvents that could be used to dissolve the superhydrophobic chemicals are not the best things to put on your skin. In addition to doing odd things to the surface of your skin, some of them might be able to go right through your skin and end up in your blood. Generally these kinds of organic solvents are not the best things for your liver. Ignoring the safety concerns for the moment, spraying NeverWet on your hair would probably “work” pretty well. Any strands of hair that it coated would probably be very hydrophobic. Getting a nice even coating on your whole head of hair would probably be difficult though. That being said, humans (and other animals) already release natural oils (called sebum) from their hair follicles to give their hair a hydrophobic coating. While it quite as effective as the chemicals in NeverWet, it does a pretty good job. Now on to your question about nano-silver in socks. You are absolutely correct that the silver works as to kill bacteria. The bacteria that live on your skin and in your socks love to live on the sugar and salt in your sweat. Due to the design of most shoes (think of them as caves for your feet!) they are the perfect place for bacteria to grow. Most bacteria love warm, dark and humid environments like the inside of a shoe. So what does this have to do with smelly socks? When you smell a stinky pair of socks, what you smell is not the sweat (that has almost no actual odor) but rather the waste of the bacteria that’s eating the sweat. By adding nano-silver to socks, we prevent the growth of most of those bacteria and thus the release of their odorous excrement. Good luck and let me know if you have any questions! 1.) We were curious to know if the different shapes have different effects? Awesome question!! Shapes can totally have an effect on a nanoparticle’s behavior. It is a huge area of study that many scientists are trying to understand and find usage for. One of our scientists, Becca, touched upon this in her blog post here: http://sustainable-nano.com/2013/09/05/nano-koosh-balls-what-theyre-good-for-and-how-i-made-them/. You should check that out. In Becca’s post, she talks about how her Koosh balls made up of nano rods are unique. Elongated nanomaterials (nano rods) cause the electrons to move differently than they would in a spherical shape. 2.) We would like to know how nanotechnology will help astronauts survive in space and get there. Thank you so much for making time in your exciting, interesting and Nano technological day to video chat with us! I learned many things that I had never even heard of, including information about the nano scale, and finding out how small things really are! It¹s amazing how the thing we think are so small, like a grain of sand, or a strand of hair, are not small at all. Thosetwo things just appear small, but really, they are two of the biggest objects on the nano scale. I am thinking about researching hydrophobic spray on shoes. My idea was to see if you sprayed a pair of uggs, or any other pair of shoes, and put them in the snow or in a wet substance if it would still get wet. When uggs get wet, it ruins the fabric and makes a mark. My second idea is to research putting super hydrophobic substance on bathing suits too. These are two really good ideas. Many companies already incorporate superhydrophobic and superhydrophilic coatings into a number of products. Be aware though, that many spray on hydrophobic coatings traditionally have used specially designed organic molecules that have a high fluorine content, and the release of the these molecules into the environment is a source of concern (http://www.nytimes.com/2003/04/15/science/epa-orders-companies-to-examine-effects-of-chemicals.html?pagewanted=2). As a result, many companies today are exploring new ways to make superhydrophobic coatings. For swimsuit technology, most companies have actually tried to make use of of materials that mimic superhydrophilic surfaces, like shark skin. Again, excellent ideas. Superhydrophobic and superhydrophilic surfaces are, I think, some of the most amazing naturally occurring materials. Thank you so much Mr. Sam. What you told me was so interesting, and the websites you left were very helpful. I also agree that the topic is amazing and that it would be so cool on bathing suits. I’m just a bit confused on what superhydrophilic surfaces, but I’m sure that it is really cool. Thanks! Superhydrophobic surfaces resist wetting by liquids like water, causing the water to bead up very strongly. Superhydrophilic surfaces are the opposite; water wets the surface of the material very strongly. Shark skin, for instance is covered in plates of “teeth” (also called denticles). Unlike a superhydrophobic surface, water easily slips down in between the denticles as the shark swims. For ocean-going animals like sharks, having this superhydrophilic skin cuts down on drag as they move through the water and prevents parasites from latching on. Cutting down on drag allows the shark to swim more freely and easily through the water. Thus, shark skin was the inspiration for many fast-skin swim suits. Thank you for video chatting us, we really appreciated you taking the time out of your day to answer our questions! You really gave us more knowledge on nanotechnology and helped us brainstorm possible topics for our project. One thing that stood out to us during the video chat was how nanotechnology can change how we use and make energy for everything, including the solar panel idea. A few ideas that my partner and I were thinking of were how nanotechnology could possibly heal broken bones in minutes, how nanotechnology can cure cancer can cure cancer at the source, how we can replace air conditioners with something cleaner for the environment, and how we can possibly make spray-able solar panels. Could you tell us which one you think is the best to research please? Again, thanks so much for the help and the informative video chat on Friday! You are very welcome. We are glad you enjoyed chatting with us about nanotechnology. These are all really interesting topics to research, and any one of them would make for a great project. While trying to pick which topic to research I would keep a few things in mind. First, is there one topic that you really can’t wait to learn more about? If one of you is really excited about a particular topic I would go with that one. All of these topics are great! If you still can’t decide you should see which topic you can find the best information about. I didn’t know that carbon nanotubes may be promising in healing bones, so that is super exciting, but if it is super new, you may not be able to find a lot of informative articles, or other sources yet. You did mention that one of the topics that stood out to you during the video chat was how nanotechnology can play a huge role in the future of energy use, so maybe look more into the solar panels? I hope this helps and good luck with your project! We really liked video chatting with you and we thought it was very helpful. One thing that we found interesting is that you can turn the suns energy into solar power using nanotechnology. What we wan to is how nanotechnology is incorporated into cosmetics. We would appreciate if you can tell us more about it. http://www.ncbi.nlm.nih.gov/pmc/articles/PMC3425166/ here’s a link that talks about it. Another topic we would like to know more about is transition lenses. Transition lenses are the lenses you put in glasses that go from light to dark in the sun. We want to know what the relationship of the lenses has to do with nanotechnology. Here’s a link that explains a little about transition lenses. http://en.wikipedia.org/wiki/Photochromic_lens. Nanotechnology is being incorporated into cosmetics in a number of different ways. One example is sunscreens. Two types of nanoparticles, titanium dioxide (TiO2) and zinc oxide (ZnO) are used in some sunscreens to scatter and absorb UV light. The scattered UV light is deflected away from the skin and the absorbed UV light is released as heat; both of these mechanisms protect your skin from direct contact with damaging UV light. Hopefully that was helpful– good luck with your project. 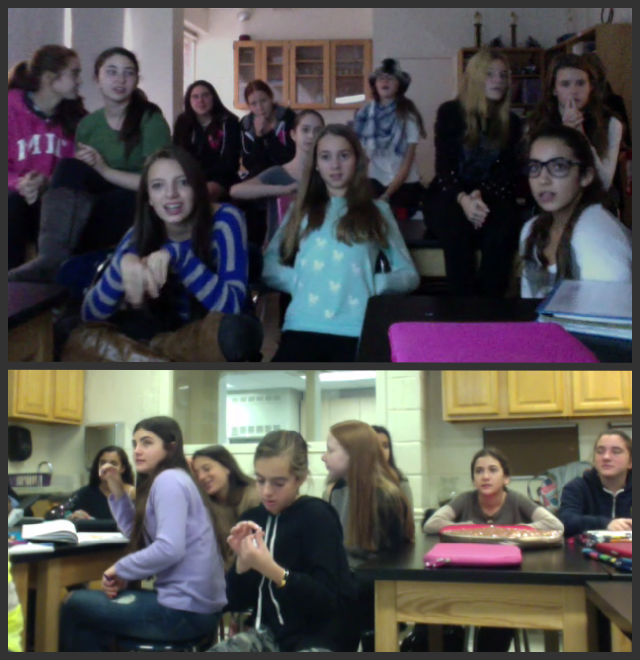 Thank you so much for video chatting with us on Friday! We learned many new things about nanotechnology. We are interested in learning about the future flexible phone. We were wondering how the flexibility of the phone would not mess up the software. Also, we were wondering how flexible the phone would be and how many years it is predicted to last. Lastly, we were wondering if these were good sources to use https://research.nokia.com/morph, and http://www.nanowerk.com/news/newsid=21226.php. Thank you so much! Hi there! Glad you learned a lot from the video chat! So software is really just the “instructions” that tells a computer or a phone in this case what actions to perform. So the software isn’t a physical thing (it can’t be touched) so flexibility really wouldn’t have much effect on the software. The hardware on the other hand are the physical objects within the phone. Designers of the flexible phones would definitely have to pay attention to the hardware (ex. processors) when they are making their prototypes. Both of your websites look like they have good information. Good luck on your project! We had a blast video chatting with you! We learned so much about nanotechnology, and how advanced 21st century science is. One thing that we enjoyed learning about a lot were the nanotechnology products, like the bendable phone and the filtering water bottle. We were wondering if you could tell us any more products involving nanotechnology. Also, my partner and I are thinking of doing our project on superhydrophobic spray and spray on cotton clothing. Can you give us any information on that? Lastly, we were wondering if http://www.zmescience.com is a reliable source. 1.) A reliable website to check out where we can find nano is at http://www.nanotechproject.org/. Nanotechnology is almost everywhere you look! Surely, they have made their way into our personal care products, food, and clothes (to mention a few). 2.) Superhydrophobic spray is super interesting. You might have heard some of your classmates mention a product called NeverWet. It is designed to make a superhydrophobic coating on things you spray on. If you look at some of the questions/answers on this blog post, you will find a lot of information and where to look as well. The website you found looks okay but you might want to verify it with other sources as well. I’m so glad we had the opportunity to video chat someone from your team. It was a pleasure to learn about nanotechnology from you and we thank you for your time. Nanotechnology is very interesting and I really loved learning about it, I am mostly interested in creating unbreakable material using nanotechnology and would love to know some more information about it. Right now I do not understand how you can make a device indestructible and using that, you can make it bend or flexible. Another thing that I don’t understand very well was how the nanotechnology can be used in more than one material, for example, a phone cannot break using the nanotechnology, but will a binder rip using the same nanotechnology? Thank you again. One of the best things about nanotechnologies is that it can help us make materials that blend several really useful features together. One of the materials you referenced can potentially give manufacturers a way to incorporate more electrically active surfaces into flexible materials. The technology, which incorporates nanostructured pieces of metal oxides, could allow manufacturers to make a flexible and bendable device that is also sensitive to touch. While a device like a phone using this sort of technology wouldn’t be completely indestructible (pretty much anything, including atoms, can be destroyed if we put enough energy into it…) it would be much less likely to be damaged if it falls out of your pocket. Hi! Thank you for video chatting with our class on Friday. I was really excited and thought it was really cool that we got to do this with you guys. I do have a few questions for you. I was thinking about doing a project on using nanotech to make any liquid not wet a solid. Could you be able to tell me about that and ways to make this possible? Another idea I have I think is a little impossible but I thought it was really cool. I was thinking about using nanotech to make a an empty water bottle to gather moisture in the air, filter it and use it for regular drinking water. This sounds really crazy, but, does it have relation to the LifeSaver Bottle with the filter? Lastly, (I promise!) are these credible and useful sources? In regards to your first question, what you are referring to is hydrophobic materials. As you may know, hydro- means water and -phobic means fearing, so these are materials that do not like to interact with water because there chemical properties are so different. This is an extremely interesting field, and one that has many useful applications! This phenomenon was first seen in nature, on the lotus plant. Since there is so much information on this topic, I will provide several useful links. Although very interesting, I am not sure how nanotechnology could be used to answer your second question. Nanotechnology can be used for water purification. These systems will use a filter with very small pores to remove most contaminants. Additionally, silver nanoparticles can be used to kill bacteria, as silver ions are antibacterial. I hope this helps, Ashlie! Feel free to reply to this post with any additional questions. Good luck on your project! It looks like the idea of nanotechnology in forensics has attracted of interest here. I would definitely re-read and check out all the links in the Whodunit post, as well as checking out some of the answers our bloggers have given to the other questions about forensics. Thank you for taking the time to video chat with our 8th grade science class. We are learning a lot about nanotechnology in Science this semester and we have a few questions to ask about our project. For starters, we are wondering how nanotechnology is used to create the shapes, colors, and the explosions of fireworks. Another question that we have is about the bendable phone. We want to know how to make the metal bendy or almost rubber like, using nanotechnology. We are open to any ideas or suggestion that you have to offer. We are glad you learned a lot from the video chat! Using nanotechnology in fireworks is a pretty new thing, so it will definitely be interesting for you to keep up with this technology. In order for a firework to produce the nice colors we see they contain a fuel and an oxidizing agent which mix together. Usually the components are particles in the ~100 micrometer size range. This is about the size of the width of a human hair. Because the particles are so small, the fuel and oxidizer combine nearly instantaneously. This quick combination allows the tiny particles to release their beautiful color. Research has shown that scaling down the size to use nanoparticles in fireworks would allow the components to mix even faster because smaller particles have larger surface area. This also allows for a more powerful explosion. Because of the small size, a smaller amount of particles could be used. This could mean a firework that is more environmentally friendly. I haven’t been able to find anything about nanoparticles being able to create certain shapes in fireworks, but for more detail about these nano-enabled fireworks check out a blog post we have put up: http://sustainable-nano.com/2013/07/22/nanomaterials-making-their-way-into-fireworks/. Here is another resource which gives a good explanation with an interview: http://www.livescience.com/33369-fireworks-shapes-patterns-pyrotechnics.html. Nanotechnology is also going to play a huge role in making many electronics bendable, including phones. Nanomaterials allow us to store more energy in a smaller place, and if you can make a phone with less material, then it can be thinner—thin enough to be bendable! Try searching for some articles because this is really cool! I hope this is helpful and good luck with your project! You are right that nanoparticles have been used to make better tennis balls. In this case, people have used clay nanoparticles rather than nanodiamond, but the process works just as you described—the nanoparticles form a sealant that helps prevent air from leaking out of the core of the tennis ball. A really good picture of this is included here: http://nano–tech.blogspot.com/p/leisure.html. The website you provided looks fine, but you may also want check out this page for additional information on how nanoparticles are being used in sports: http://nanotechnology.unlv.edu/ee453_fall2008_projects/ee453_project7.pdf. I would recommend reading through the articles that are included in the references on the last page. One of the most common uses of nanoparticles in sports is as antimicrobial agents in clothing, like socks. Silver nanoparticles can be embedded in clothing fibers, where they can kill bacteria and fungi that grow in sweaty clothes and make them stink. The silver nanoparticles do this by releasing silver ion that is very harmful to bacteria and fungi. You may even own socks that say they are “antimicrobial”—these probably contain silver nanoparticles. Hopefully this is helpful—good luck with your project. Thank you for taking time out of your day to talk to our science class. I gathered so much information about nanotechnology and what it could be used for. One thing that I was hoping to get information on is how nanotechnology could come into play when it comes to fireflies and why their tails glow. Could humans use the way their tails glow? I would also like to collect some more information on how nanotechnology could be used when it comes to cosmetics. Finally would these sites be a good resource when researching? Thank you very much for your assistance in my research! First of all both of your websites look like fine sources of information! I was actually going to recommend both of them as good starting points. Secondly, your question about fireflies is a fantastic one! Firefly tails glow because of a process called bioluminescence (this would be a good word to use when you’re searching for other research material). Simply put, bioluminescence is the direct production of light that appears as a result from a chemical reaction occurring within a living organism (such as a firefly). The reaction itself that occurs is a little complex, but if you’re interested in reading about it you could check out this site: http://www.firefliesandglow-worms.co.uk/bioluminescence.html (it also gives a few other examples of organisms that “glow” besides the firefly). But in terms of humans using this process for their benefit the first article you found is a good place to start. The group mentioned in the link you posted has the best example of using the glow of fireflies for potential human benefit that I’ve been able to find. If this process is optimized and becomes really, really efficient humans could use light from the fireflies to generate energy. Could you imagine if firefly-nanorods became the new LED lights – no batteries or electricity necessary?! How crazy/awesome would that be! Thanks again for taking time to video chat with us! We are excited to learn more about nanotechnology. As far as cookware goes, you’ll find many products in the link you already found. The cookware applications I’ve heard the most about are serving utensils coated with silver (Ag) nanoparticles – to help sterilize them (keep bacteria from growing on them) and nanostructured materials that heat very efficiently due to their large surface area. I hope that helps you and that you discover some exciting new things as you research nanotechnology further. Hello there Gossip Girl (love your name, by the way!! ), we think it’s super awesome that you guys enjoyed the video chat! You bring up some awesome questions! I think clothing (textiles, in general) are a great area to do research in. A lot of people tend to forget nanomaterials’ impact in this area. 1.) How do nanoparticles make the fabric guarded from the UV radiation? Think of this as a “sunscreen” for clothes. When you go outside for long hours during the summer, you may recall using sunscreen to protect you from the sun’s UV rays (see here for more info: http://www.epa.gov/sunwise/doc/uvradiation.html). Most sunscreens contain TiO2 (titanium dioxide) or ZnO (zinc oxide) nanoparticles which absorb a significant amount of UV light radiating at us. Since light is a form of energy, these nanoparticles often get heated up after absorbing the UV light. Therefore, most sunscreens also contain some sort of material that will be able to absorb the heat (so you don’t even know it’s working…other than the fact that you don’t get burned). (see more background on this at http://www.loc.gov/rr/scitech/mysteries/sunscreen.html). 2.) What makes the clothing stain resistant? Good luck with your project!! And the links you sent will work well also. Thank you so much for carving out time in your day to Skype with us! We really appreciate it. The information that you provided us with was very helpful for us to start thinking about our different ideas to start researching about nanotechnology. We have a few thoughts on what we may want to research and were wondering if you could give us some insight. Our first idea was to research the field of nanotechnology in waterproof makeup. We want to know how waterproof makeup is made and how it relates to nanotechnology. Our second idea was to research the field of nanotechnology in music. We would research about sound waves. We have some connections with music producers and we want to know your opinions. We don’t know if there is anything to research in the field of music but we would want to do that if possible. Lastly, we would like to research the field of nanotechnology in hair products and how they work, frizz and hairspray and how it stays… etc. Of course we are open to many ideas but we would love to hear your opinion in our ideas about nanotechnology. Thank you for taking your time to read this and responding. Waterproof makeup (usually mascara) is made to contain some hydro-phobic (water-fearing) waxes. Most manufacturers of waterproof mascara use candelilla or carnauba wax to increase the hydrophobicity of the mascara formulation. Both of these waxes come from plants and have a long history of safe human use. By increasing the hydrophobicity, water from tears or sweat or rain will not interact and mix very well with the mascara, preventing it from running. I’m not aware of and couldn’t find anything about using nano-technology to make makeup more waterproof. That’s not to say it hasn’t happened, it just might not be quite ready for release yet. While there manufacturers might not be deliberately putting nanoparticles in make-up, there are probably some nano-sized particles in the formulations. To give make-up a nice consistent sheen and color, manufacturers use ground minerals (such as TiO2 and Fe2O3) as pigments. In the grinding process, some small amount of nano-sized particles are probably generated and end up in the finished product. One of the biggest current uses for nano-technology is in sunscreen. Titanium dioxide (or TiO2) adsorbs many of the harmful UV light rays that burn skin and increase our risk of skin-cancer. By using nano-sized TiO2 particles compared to larger particles, the sunscreen is easier to rub in and doesn’t leave such a noticeable white chalky film on the skin. Switching topics to music, I’m not aware of any use of deliberate use of nanoparticles in musical instruments. One related field that people have begun to use nano-particles in is new loudspeaker technology. Earlier this year, a group of researchers in Stockholm Sweden created a new type of ultra-thin speaker by coating a cellulose film (made from wood pulp) with magnetic iron nanoparticles (see the links below). As to your last topic, non-frizz hairspray (and really all hair sprays) work by dispensing a small amount of a sticky substance (usually a copolymer of polyvinylpyrrolidone and polyvinyl acetate that has been dissolved in a volatile solvent) onto your hair. As the solvent (usually something like ethanol) dries, the sticky substance forms a crust on your hair and holds it together. While it’s not marketed as a way to control frizz, one hair care I did find that claims to use nanotechnology is something called “Nanothik” (link below). It claims to contain nano-sized liposomes (basically tiny balls of lipids) to aid in the adsorption of vitamin B5 by hair shafts. Apparently vitamin B5 is supposed to plump hair strands making your hair appear thicker. Good luck with your research and let me know if you have any more questions! I’m happy to help! Thank you for video chatting with us on Friday! My partner and I really enjoyed learning about nanotechnology and what it is. We are thinking about 3 different topics and we wanted your opinion on which would work best. The first one is nanotechnology to create neon lights. Can you tell us a little bit more on that? The second idea is how nanotechnology might used in banking or finance – for example, in fingerprint security technology for electronic devices like Bloomberg units. Are there other ways to use nanotechnology in finance or banking? Lastly our 3rd idea is about the use of nanotechnology in makeup. Thank you again! Good luck with your project! Feel free to write back to this post if you have any further questions. Thank you so much for video chatting with us on Friday! Our class loved talking to Dr. Bishop and learning all the interesting things that are going on at the Center for Sustainable Nanotechnology! We are really interested in researching about how Nanotechnology has impacted cancer cells, and we were wondering if you could tell us more about that. Also, we were wondering if you could tell us how nanotechnology is used in veterinary medicine. We also loved learning about Lithium Ion batteries in the presentation, and we wanted to learn about how exactly those are used. For research, we were wondering which site was the best for researching about Nanotechnology. We were thinking the gov site (http://nano.cancer.gov/) but we also thought the MIT site was reliable (http://ki.mit.edu/approach/partnerships/ccne) Are there any sites you recommend for researching about Cancer and Nanotechnology? We found this site for researching Nanotechnology and Medicine, http://www.scopemed.org/?mno=1783 but we wanted to know if you recommended any others. Thanks very much for the questions! The National Cancer Institute and MIT’s sites are two excellent places to start researching nanotechnology and nanotechnology in cancer research. Here are a few more, one hosted by Georgia Tech and one from Rice University. Professors Naomi Halas (at Rice) and Mostafa El-Sayed (at Georgia Tech) were some of the first researchers to demonstrate how gold nanoparticles could be used to destroy tumors using photothermal heating. Thanks again for those questions. Hope the links are helpful. Also, thank you so much for video chatting with us last friday! We learned lots and it was very helpful. Hope to hear from you soon! Hello! A project about nanotechnology on crime investigations and prevention sounds extremely interesting. This is an aspect of nanotechnology that is not discussed very often. You’re right, scientific articles can be difficult to follow, so I hope that this response will help you with your research. I’m sure you have seen or read about investigators using powder and brushes to find fingerprints. Since fingerprints are unique to each person, fingerprints can be very helpful in an investigation. When trying to dust for a fingerprint, the best powder would stick to only the fingerprint and nothing else so that it is easy to tell the shapes and lines in the fingerprint. However, the powders that are traditionally used stick to the background that the fingerprints are found on making it difficult to pick out the fingerprints. There is hope that nanotechnology can help to fix this problem. There has been research done that shows that using nanoparticles in the powders allows for better prints and these powders also work in more conditions, like when it is a damp area. Using nanoparticles also allows investigators to view the prints under UV light, which can help them examine the fingerprint. Another cool thing that nanomaterials can help accomplish is to get more information out of a fingerprint. An example given in your first article explains that the powders with nanomaterials can be made with other compounds which will allow investigators to identify if the owner of the fingerprint had handled explosives. One of the advances that nanotechnology is making possible that I think is really awesome is that nanotechnology can be used to gather information on fingerprints from old cases. This is important for cases where the fingerprint is maybe only a partial fingerprint, or has been compromised in some way. Researchers have developed a technology involving nanoparticles that can reveal traces from old fingerprints in far greater detail than previously possible by being able to detect amino acids from the prints. After we listened to your informative and detailed presentation, we are interested in researching more about nano-diamonds. We are particularly interested in how nano-diamonds can be used to help cure certain cancers. We are looking into the research of Dr. Dean Ho and how he is using nano-diamonds in chemotherapy. What other ways are nano-diamonds used? What do nano-diamonds do in the cancer curing process? Nanodiamonds are made entirely of carbon, which is one of the most common elements in the human body. This makes them a good candidate for use in treating diseases like cancer, because they are made of material that is familiar to the body. As you know, Dr. Dean Ho has worked on developing ways to use nanodiamonds to treat cancer. One of his ideas is to stick a cancer drug on the surface of nanodiamonds and then inject these directly into a tumor. The nanodiamonds are so small that they can enter tumor cells, where they release the drug that is stuck to their surface, killing the cells. If nanodiamonds aren’t used and the cancer drug alone is injected into the tumor, the tumor cells can expel the drug before it has a chance to work. Since the tumor cells have more difficulty removing the nanodiamonds, the drug is trapped in the cell for a longer time, giving it time to work. For more information on this, see this website. Nanodiamonds are also used to make better lubricants. This may sound weird, but adding nanodiamonds to lubricants changes their viscosity (“fluid thickness”) and can create a rolling action (like a ball-bearing) that reduces friction. Nanodiamonds can also be added as filler to other materials, making them stronger (for example, stiffer and more resistant to scratching). All three of the links provided seem credible, but I think that links one and three will give you with the most information. It may be interesting for you to compare the perspectives of people who work at a company that makes nanodiamonds (link one) to people who work at a university that researches nanodiamonds (link three). I hope this is useful– good luck with your project. a reliable one? Lastly, do you think this video, has valid information? Hi there! Glad you enjoyed the video chat! Electronics can be made bendable based on the materials that they are made out of. Materials have different properties (such as flexibility) depending on what they are made of. For example, some phone displays are now being made out of bendable plastic substrates rather than glass. You can imagine trying to bend glass, that wouldn’t work so well! But by changing the material to a plastic it increases the flexibility. This same idea goes for other electronics. You can basically print or assemble circuits onto flexible plastic substrates which allow them much more flexibility. Pretty awesome stuff! Your two links didn’t show up so I unfortunately can’t comment on them, but if you’d like to try to re-post them I’d be more than happy to take a look! We really enjoyed video chatting with you on Friday. My partner and I are doing a project on nanotechnology. We are interested in three different topics, the flexible phone, nanotechnology in makeup products, and nanotechnology in hair products. Is this a good website to use? http://www.dailymail.co.uk/sciencetech/article-2449413/UNBREAKABLE-flexible-display-phone-screen-unveiled-LG.html Do you recommend any other websites on this topic? We would also like to know if this website is reliable http://www.topbanana.us/nano_technology_0n_hair_care.htm. What year do you think that the flexible phone will come out? We have seen several different release dates for the phones. Also, what makeup products contain nanotechnology? Thank you so much for helping us understand nanotechnology better! That website looks fine (for the flexible phone question). There is another company that is close to having a flexible phone (Samsung), so you may find interesting information in stories related to their products as well. If you want to learn about flexible displays in general, I suggest a website like this one: http://www.howstuffworks.com/search.php?terms=flexible+display. I’m not sure when a flexible phone will come out… but it seems like it will be soon. Phone technology is moving so fast and flexible electronics are possible. I think the big question here is if the flexible technology can be easily integrated with the required processors and microchips. My partner and I loved your video chat last Friday! We learned so much about nanotechnology. We were interested in many topics for our Nanotechnology research, but a few stood out to us. We really like the idea of using nanotechnology to reduce the amount of fuel used in rockets for space. We found a website that researched it and we wanted to know if you think it is reliable. http:www.understandingnano.com/column-space.htm . If we decide to do this topic, we have a question: Since we are finding ways to use less rocket fuel, are we going to be able to do the same using nanotechnology with cars and other normal forms of transportation in the future? We also were interested in nanotechnology in everyday objects, like toothpaste and iPhones. This is the website we found for that: http://www.technewsdaily.com/5724-nanotech.html What are your thoughts? Thank you for taking time to video chat with us and helping us with our research! I find that the http://www.understandingnano.com/column-space.htm contains a lot of very interesting information. Unfortunately, most of this is not cited (no bibliography). However, the same server had this page http://www.understandingnano.com/space.html ; which I found to be quite reliable because it gives you links to reliable websites such as NASA. I would start there instead. 2.) Question: Since we are finding ways to use less rocket fuel, are we going to be able to do the same using nanotechnology with cars and other normal forms of transportation in the future? Aha! You pose a very interesting question! I don’t see why not. The fuel used in rocket fuel might not necessarily be usable in cars directly. But it will probably be able to give scientists an idea as how to apply it to cars and other modes of transportation. 3.) Question: This is the website we found for that: http://www.technewsdaily.com/5724-.html What are your thoughts? TechNewsDaily is definitely not the first to mention all of these futuristic innovations. If you want to know more about them, I would do a search on each of the innovations discussed. A reliable website to check out where we can find nano is at http://www.nanotechproject.org/. Nanotechnology is almost everywhere you look! Surely, they have made their way into our personal care products, food, and clothes (to mention a few). I should also mention that not everything nano is synthetic though. For example, the cow udder is a natural nano factory of sorts…producing particles of fat and protein globs that are very small. Casein protein particles range anywhere from 300-400 nm and fat particles range from 100nm to 20 micron. The small size of these particles helps keep them floating in the milk, so that what comes out of the cow udder is an evenly mixed and yummy liquid instead of a clumpy mess (for more information, see http://www.ncbi.nlm.nih.gov/books/NBK32727/). Thank you again for your help in my research! Omni-phobic (meaning everything-fearing) coatings like the one you mention are very neat indeed! The one you reference works so well by creating a very complex structure on the surface of the coated material (like the fabric of a shirt). If you could zoom in to the nano-level of the coating, you would see that it is not a smooth coating at all. It is actually made of a web of nano-sized fibers. This helps repel some liquids as the droplets really do like being in air; they much prefer snuggling up close to something solid. From an energetic point of view, getting close to something solid helps them relax. Because the omni-phobic coating is a complex web with lots of air, droplets of liquid have a hard time finding a place to nestle in. The web just has too many pockets of air for droplets to get (energetically) comfortable. Instead, they ball up on the surface or roll right off. They have some neat images that Gizmag doesn’t have. Good luck in your research! super cool that you are trying this! Have a question for our scientists or an idea you want us to write about? Can gold melt at room temperature? Melting temperature depression! What is Aqua Regia, and what makes it royal? This material is based upon work supported by the National Science Foundation under the Center for Sustainable Nanotechnology, grant number CHE-1503408. Any opinions, findings, and conclusions or recommendations expressed on this web site are those of the participants and do not necessarily reflect the views of the National Science Foundation or the participating institutions. Unless otherwise noted, content on Sustainable Nano is licensed under a Creative Commons Attribution-NonCommercial-ShareAlike 3.0 Unported License.